Everyone knows about the Sistine Chapel and its importance to art history. 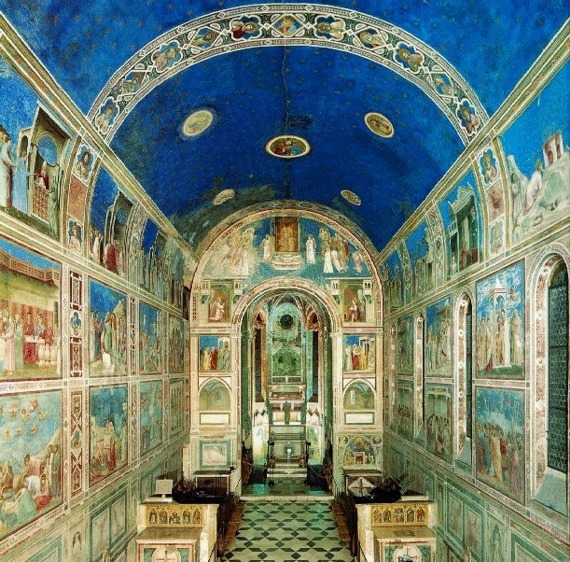 Another such artistic monument is the Scrovegni, or Arena, Chapel in Padua, Italy, the interior of which is covered with fresco paintings by Giotto di Bondone (c. 1266-1337). 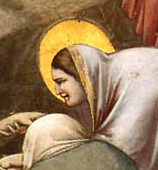 Looking around its interior – virtually, via books and online sources, since I’ve never actually been there – I was struck by the extent to which Giotto anticipated Renaissance era painting in his work, during a time in which the more stylized, Byzantine approach still dominated Western religious painting. 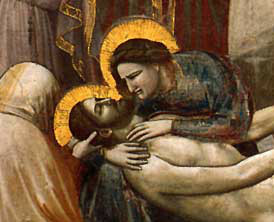 Among the most impressive and moving of the paintings in the Chapel is one widely regarded as one of Giotto’s masterpieces, The Lamentation. Having already featured it in this week’s Wordless Wednesday, I thought it might also be interesting to examine this painting in more detail, to try to figure out exactly what is so affecting about it. First, a little background. In the early years of the fourteenth century, Enrico degli Scrovegni commissioned a church to be built on his property in Padua, to serve as a worship and burial space for his family. 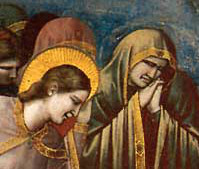 From a banking family, Scrovegni was concerned about his and his family’s place in the afterlife, very much aware of how usury, money-lending with a high interest rate, was regarded back then (in fact, Dante placed Scrovegni’s father Reginaldo in the seventh circle of Hell in his Inferno for this very reason). Commissioning art for churches was a very common way for financially well-off people to “earn” their way into Heaven through good works. The Scrovegni Chaple is also commonly known as the Arena Chapel, since it was built near the site of an ancient Roman arena. Relatively plain from the outside, the interior of the Chapel is filled with one of the masterworks of art history. Giotto’s cycle of frescoes was begun around 1303 (some speculate that, as an architect, he may have designed the Chapel as well). His work may have been completed in time for the Chapel’s consecration in 1305, although it may also have continued as late as 1310. By the altar, Giotto painted the Annunciation, and at the other end, by the entrance, a large Last Judgment. Along the long walls are found the stories of Mary and Jesus Christ, depicted in 37 fresco vignettes arranged in three tiers, with each painting roughly 7.5 feet square. Giotto, as was common in that time, relied largely on the Bible for the subjects of his paintings but also drew on some extra-Biblical sources, including the Meditations on the Life of Christ by the late thirteenth century monk known as Pseudo-Bonaventura. Depictions of The Lamentation traditionally show Jesus’s body, having been removed from the cross, being mourned by family members and friends. In the visual iconography of that time, Biblical figures are usually marked out by their halos. By the eleventh century, the Lamentation had become a frequently depicted scene, with Mary and Jesus of course at the center of the drama. 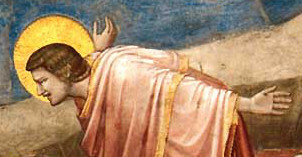 Returning to Giotto’s painting, in the foreground are five figures surrounding and forming a circle around Jesus’s body, which we can see does not touch the ground. Three of the figures are women, wearing halos and biblical clothing, holding Jesus’s body. Two others are turned away from us. Two hold aloft Jesus’s hands. 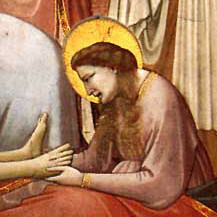 At Jesus’s feet is Mary Magdalene, recognizable by her long red hair. Cradling Jesus’s head and upper body, of course, is Mary, her own head in close juxtaposition to that of Jesus (incidentally, the term Pietà, Italian for “pity,” refers to works in which just Jesus and Mary are depicted, with Mary holding the lifeless body). In the middle ground at the right side of the painting are three men. One, the leftmost one, is almost certainly St. John the Apostle – along with the halo he is often depicted with short hair and a clean-shaven, youthful appearance. He gives himself up entirely to his grief, with arms outstretched and his body inclining towards Christ’s. The two men behind St. John, the only ones remotely calm and peaceful in demeanor, are probably Joseph of Arimathea (the grey-bearded one) and Nicodemus, who are specifically mentioned in the Gospels as having been present. Finally, at the left of the painting and in the middle ground is a crowd of mourning women. A rocky mountain ridge divides the composition and directs our gaze toward Mary and Jesus. The tree in the background is likely the tree of the knowledge of good and evil, barren since the Fall of Man and reminding us of original sin. In the sky are eleven angels, like almost all of the other figures sharply depicted in their forms of grief. One might say, in fact, that in this painting, Heaven and Earth are joined in mourning. The human figures and architectural spaces aren’t stylized, in the Byzantine manner of some of Giotto’s contemporaries like Duccio or Cimabue (Giotto’s probable teacher and mentor). There is a sense of three dimensions, if a little more compressed than what we would see in paintings a century or two later. 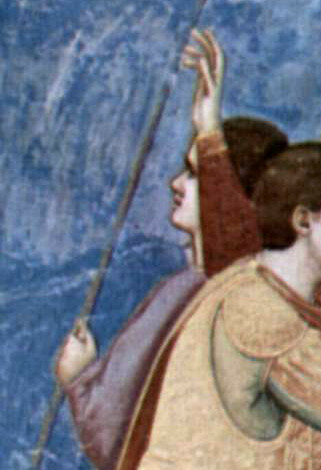 The muted pastel colors are fairly typical of fresco painting; the blue azurite used for the sky, once probably quite brilliant, has also faded. The humans wear clothing that drapes naturally, and their facial and bodily expressions are recognizably emotional. 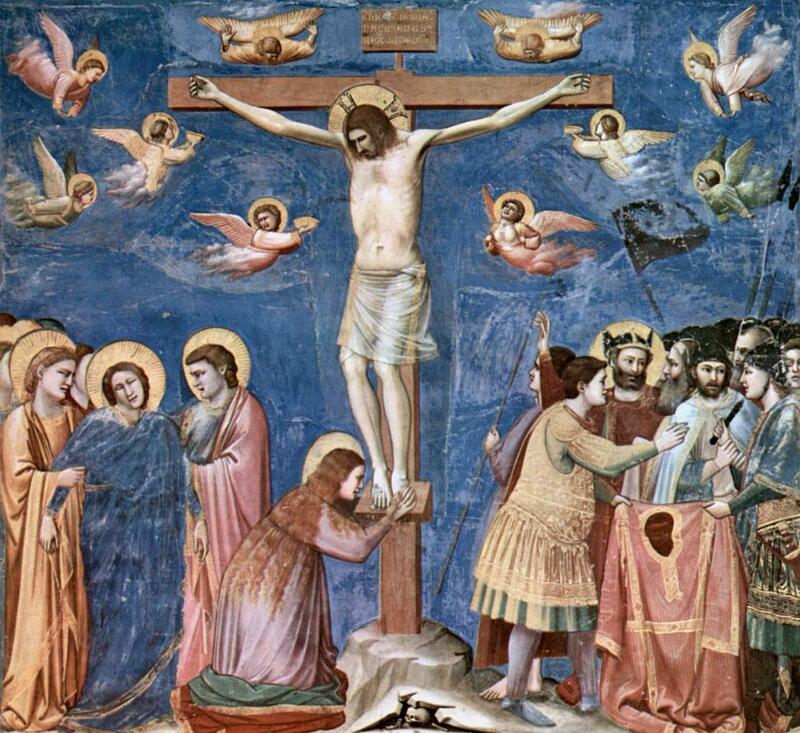 A fascinating comparison is to be made with the painting just to the left of The Lamentation in the Arena Chapel, Giotto’s depiction of the The Crucifixion. The Crucifixion is very symmetrical, even orderly. 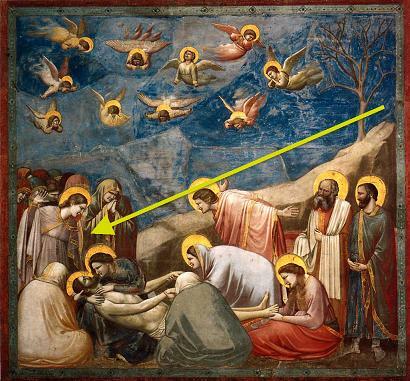 This emphasizes, as I interpret it at least, the symbolic, more ritualistic nature of the scene as Giotto depicts it. Even the grieving angels are ranked symmetrically about the cross – as compared with the angels in The Lamentation, where all order has been abandoned. Whereas, too, all attention in The Lamentation is focused on Jesus, the only human figure in The Crucifixion looking directly at Jesus is the centurion Longinus, who speared Jesus in the side but was subsequently converted. 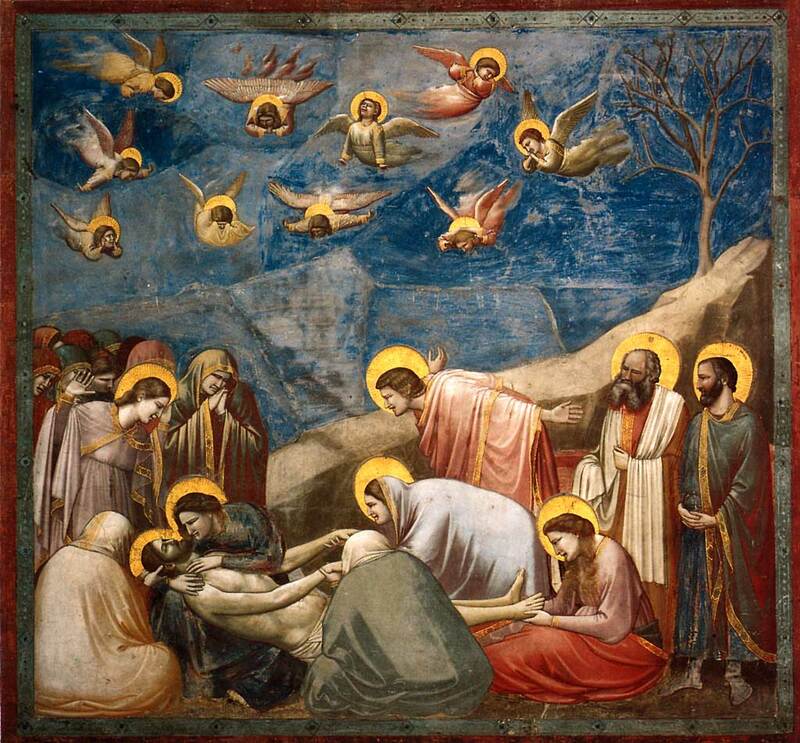 What most strongly separates Giotto from his contemporaries is the dramatic and emotional power of his work. Look at the intensity of the grief, and the variety of its expression, in both the faces and the physical postures. There is variety even in the expressions of the angels – a couple echo the posture of St. John, with arms outspread. Others mirror the gestures of the other mourning women. 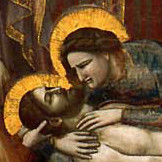 Finally, we’ve all seen many depictions of the Pietà, I would imagine, but rarely do we see Mary so intently regarding Jesus’s face, or gently cradle his body with such emotion. And see how tenderly his head is held up by the anonymous figure at the left. To explore this painting and the rest of the Scrovegni Chapel’s frescoes further, the Chapel’s own website is a good place to start for more information about the location and the paintings. Both the MyStudio website and the Web Gallery of Art take you into the Chapel, with reproductions of every painting. Came across this from Google by chance. How nice to read something so well-observed and thoughtful. You’re very kind — thank you!